Power supply AC / DC. Expert advice available via telephone. 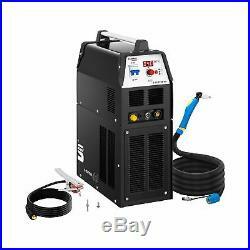 Plasma cutter with compressor - 40 A - ED 60% - Digital - 230 V. Cutting current: 14 - 40 A. Cutting power up to 12 mm. Do you have a question? 2 in 1 device: Plasma cutter with an integrated compressor. Long duty cycle of 60% at 40 A. Digital panel for 2T / 4T and the test gas function. Precise and repeatable, due to the LED display: Cutting current seamlessly adjustable. Safe, with an overheat protection. A plasma cutter and a compressor - the S-CUTTER 40 combines both and reliably cuts conductive metals such as copper, stainless steel, steel, aluminium or brass. You don't need an additional compressor as with other models. The device has a long duty cycle and a clear digital control panel. The compact and precise plasma cutter with an integrated compressor. 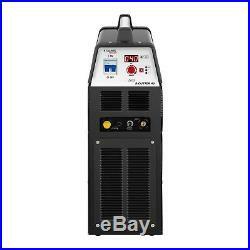 For plasma cutting with air pressure, you can choose a cutting current of up to 40 A. At the duty cycle of 60% the cutter is powered by up to 40 A. 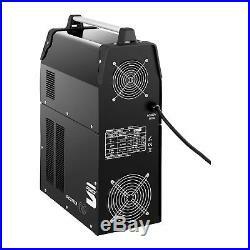 The power can be regulated down to 34 A and you can cut without pauses. The long duty cycle is possible due to the optimal cooling of the device. The clear control panel allows you to easily and precisely control all the values you need for plasma cutting. The large ON / OFF switch starts the compressor and activates the plasma cutter. You can use the digital selection button to perform a compressed air test and choose between 2-stroke and 4-stroke operation of the cutting torch. A rotary knob precisely adjusts the ampere strength. The selected value is clearly displayed on the large LED display. The cutting current can be controlled accurately and repeatedly for a large variety of metals. All buttons and the knob are arranged so that they can easily be operated with welder gloves. Depending on the metal, a cutting depth of up to 12 mm is possible. The 4.85 m cable of the high-quality PT-31 burner allows for a maximum freedom of movement when cutting joints or metals. The compressor operates at a working pressure of 4 - 5 bar, which is held automatically and ensures a stable arc for cutting. When the cutting process is completed, the gas post-flow time of up to five seconds ensures the optimum cooling of the nozzle and thereby minimises its wear. The device has an overheat protection , which is indicated by an LED diode. The protective function shuts off the device if the heat increases due to a malfunctioning. It will also spring into action when the duty cycle of the selected ampere strength is exceeded. The diode lights up and the plasma cutter is switched off. In both cases the air cooling remains active. Once the normal working temperature has been reached again, you can continue your work. A welding cart is advisable for the transport of the device, but the plasma cutter can also easily be moved with its practical carrying handle. Since it´s a 2 in 1 device, you do not have to carry an extra compressor! 230 V / 50 Hz. Cutting current at 60 % DC. Cutting current at 100 % DC. 2.5 or 5 s.
42 x 20 x 60 cm. 54 x 30 x 75 cm. The welder is equipped with a MOSFET transistor. This technology represents the highest standards of performance combined with compact and lightweight design. The result is 93% efficiency! 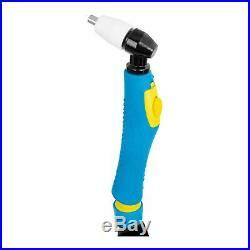 The welding current is very stable and thus ensures a perfect weld. Powerful fans ensure an optimal removal of heat from the unit. On the back of every welding machine is a screw with an earthing mark. Before use, earth the unit via a cross-section cable, which must be at least 6 mm². This device works with a 1-phase connection (230 V +/- 10 %). A non-contact high-frequency ignition in TIG mode ensures a cleaner weld starting point. Start the weld by placing pressure on the torch button. Stop the process by releasing the button. By pressing the torch button the solenoid valve opens. Allowing the gas to flow in. The gas pre-flow ignites the arc at the pre-set current. Releasing the burner button initiates a rise in the current to that of the pre-set welding current. The welding process stops once you press the burner button again. The plasma arc melts the metal and the kinetic energy of the compressed air blows the metal aside. "2T / 4T" SELECTION SWITCH. Choose between the 2T and 4T mode. Shows the welding / cutting parameters. The LED light indicates overheating or a malfunction. 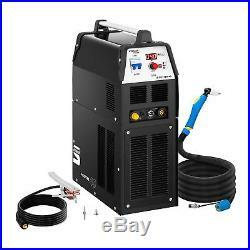 Plasma cutter with compressor S-Cutter 40. Cutting torch PT-31 with cable: 4.85 m. Power cable 1.9 m. The Stamos Welding Group offers you a variety of different and modern welding devices at extremely low prices. No matter if plasma cutters, combined devices, MIG MAG, TIG or E-Hand welders - products by the Stamos Welding Group are made for daily continuous operation and live up to every expectation. The Stamos Welding Group lays much emphasis on development and improvement of the product range. We are proud to use exclusively the best materials in our machines. Go for the brand products by the Stamos Welding Group and weld like professionals! The STAMOS Welding Group exhibits at major events within the welding industry. During the international welding trade fair ExpoWelding, the Stamos received an award for its spectacular presentation. ExpoWelding takes place every two years in Sosnowiec, Poland. This is one of the most important events in the welding industry regarding Central and Eastern Europe. At this years ExpoWelding , over 170 companies from Poland, Gerrnany, Czech Republic, Netherlands, Finland, Sweden, Canada, Taiwan, Spain, Italy and Turkey participated. The Stamos Welding Group Stand was incredibly popular, with a large number of welding experts visiting the stand. This lead to many interesting and constructive conversations. The standout product on the stand, attracting the most attention from visitors, was the WIG (AC/DC) Aluminium welding device ENTRIX 200. Our German research and development centre at STAMOS Germany designed the innovative technology within the ENTRIX 200, focusing on the usability of the labour-intensive and demanding applications that are required in industry and production. As the device was freely accessible to all visitors, they could experience it on their own. Our visitors were impressed with the quality of the welds and praised the high operating comfort of the WELBACH ENTRIX 200 welding device. For more information on the successful performance of the STAMOS Welding Group, take a look at our photo report below. STAMOS WELDING GROUP DESIGNED IN GERMANY, PRODUCED IN CHINA BY GERMAN QUALITY STANDARDS. Our devices are thought out and designed in Germany. Production is outsourced to China due to obvious cost factors. WHAT MAKES US DIFFERENT FROM THE OTHERS? The production in China is subject to German quality controls at every step of the process. The STAMOS WELDING GROUP has multiple production facilities in China. Here the facilities are matched with the quality requirements of the product lines in question. STAMOS GERMANY The red series is mainly meant for price-conscious customers. Good quality at reasonable prices. 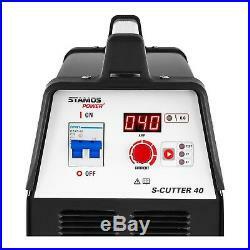 Whoever wants to weld regularly and with higher currents should choose a device from the advanced Stamos series. STAMOS GERMANY PRO SERIES The devices are equipped with 8 m long cables. Moreover the components are of higher quality, more powerful and possess a longer life span than those of the standard Stamos versions. 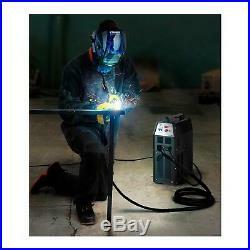 They are especially suited for customers that weld a lot and need a large distance to the welder. The recyclability and energy efficiency is higher than for other devices. Use of: paints, glues, cables and plastics with less pollutants. Tightened production controls to ensure sustainability and strongly reduce the environmental impact. The use of energy efficient components ensures minimal losses of energy. STAMOS GERMANY SELECTION The â?? STAMOS SELECTION stands for excellent quality, perfect welding seams and cuts as well as highest design requirements. These devices are characterised by great design (first products in this price class that ensure excellent composition of special metals and plastics). The use of high class steering elements and connections and the special selection of first class components e. Toshiba guarantee higher reliability and professional use. Every material used as well as every step of production is checked various times for 100% quality and the end products are repeatedly tested for aspects like processing, performance and stability. STAMOS POWER This is a further development from our Stamos series so far. The devices have higher qualities than their predecessors and are distinguished by enhanced performance. Use of higher quality and more robust connections and cables, especially resilient MOSFET transistors and other components. Construction by highly professional SMT machines (fully automatic machines, which use the surface mount technology, meaning the individual components are mounted exactly to the circuit boards with the help of lasers) for the assembly of different components and especially for the production of the circuit boards that ensure constant and reliable performance. WELBACH WWe further continue our innovation techniques and present our digital welders by WELBACH. The devices are fully digitally controlled with the help of the Stamos machine interface. The high class operation panels ensure highest comfort. The digital signal processors monitor all parameters so that the conducted work always matches the set parameters. The plasma cutters by Welbach are additionally equipped with original TRAFIMETÂ® plasma torches. The item "Plasma Cutter Metal Cutting Device Compressor Digital 230 V Aluminium Cutter" is in sale since Thursday, August 30, 2018. This item is in the category "Business, Office & Industrial\Metalworking/Milling/Welding\Welding & Soldering\Welding\Welders, Cutters & Torches\Plasma Cutters".international" and is located in Berlin.